Rough and Ready was settled in 1849 by a group of prospectors from Wisconsin who had headed west after news of Marshall's 1848 gold discovery in California. The party had named themselves the Rough and Ready Mining Company in honor of General Zachary “Old Rough and Ready” Taylor. Upon arriving in California and discovering gold, they established the town of Rough and Ready at the discovery site, and began what would be a lucrative placer operation. Rough and Ready gained notoriety when it seceded from the Union in 1850 and formed the "Great Republic of Rough and Ready". It wasn't long before the town's people reportedly voted to rejoin the Union after realizing that the independent republic would have nothing to celebrate on the Fourth of July. 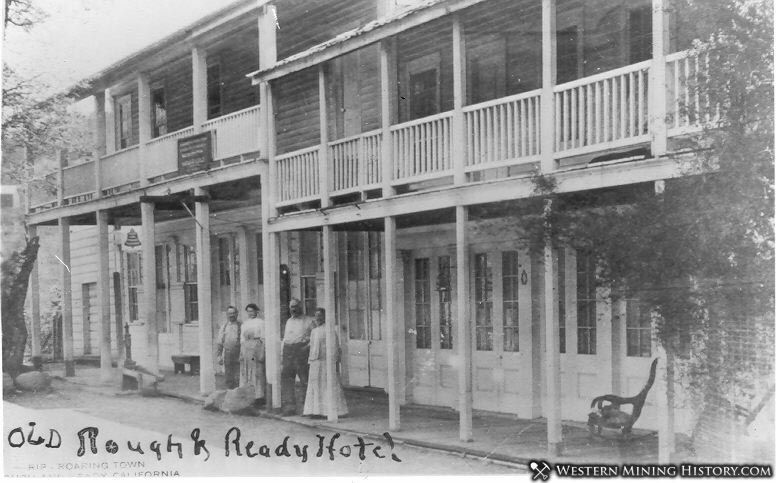 Rough and Ready became a boom town in the 1850's with a peak population of over 3,000. Several disastrous fires repeatedly destroyed the town during this decade, but the diggings were rich and so the people rebuilt each time. The last big fire was in 1859, and by this time the placers were declining and the desire to rebuild was waning. Many citizens of Rough and Ready moved on to greener pastures, and the town began the long decline into obscurity. Today Rough and Ready is an unincorporated community with a few remaining historic buildings.